LOS ANGELES – Bellator returns home to SAP Center in San Jose, Calif. on Saturday, September 23 for Bellator 183 and Bellator Kickboxing 7, which features the return of former world champ “Smooth” Benson Henderson (24-7) taking on the always-dangerous Patricky “Pitbull” (17-8), while current Bellator welterweight kickboxing champ Karim Ghajji (97-13-1) defends his title against the flashy Raymond Daniels (11-3). 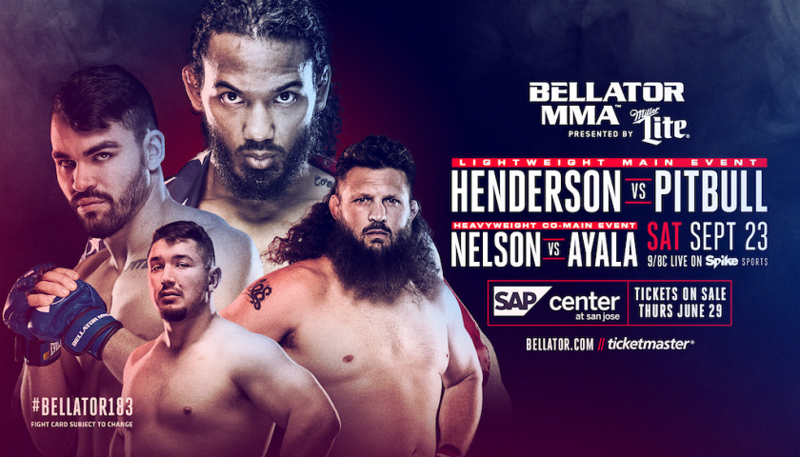 In addition, Bellator 183: Henderson vs. Pitbull will also feature the promotional debut of Roy “Big Country” Nelson (23-14) who meets California’s own Javy “Eye Candy” Ayala (10-5) in an explosive heavyweight showdown. Additional contests will be announced in the coming weeks. Following what many considered to be 2016’s “Fight of the Year” against Michael Chandler, Henderson took time off to deal with nagging injuries. Now, the 33-year-old is back to 100-percent and ready to take on the other “Pitbull” brother, following a victory against Bellator’s current featherweight champion Patricio “Pitbull”at Bellator 160 in August of last year. With wins against Nate Diaz, Donald Cerrone, Frankie Edgar, Gilbert Melendez and Jorge Masvidal already in his nearly 11 years as a professional, “Smooth” is healthy again and looking for another championship run in his already-impressive career. Patricky “Pitbull” comes into this bout seeking revenge against Henderson following his TKO win over younger brother, Patricio. The Rio Grande Do Norte, Brazil product steps inside the Bellator cage for the18th time in his professional career and will be looking to build on an impressive start to his 2017 campaign. Having won seven of his last 10 bouts, including a second-round finish of Josh Thomson at Bellator 172 in February, the 31-year-old has seen 11 of his 12 career finishes come by way of knockout. The inaugural Bellator welterweight kickboxing champion, Ghajji, traded victories with Zoltan Laszak on his road to meeting Daniels on September 23. The 36-year-old, known to many by the nickname “Gadjetboy,” will be making his fifth appearance under the Bellator Kickboxing umbrella, and will look to successfully defend his title for the first time since reclaiming the belt in April at Bellator Kickboxing 6 in Hungary. Hailing from Los Angeles, Daniels will bring his aggressive, one-of-a-kind karate style to Northern California for the first time since debuting with Bellator last year. Undefeated with the promotion — earning three stoppages in four outings — “The Real Deal” will look to punish the body of Ghajji when Daniels competes to claim his first world kickboxing title. Fighting out of Las Vegas, Nelson makes his Bellator debut following an eight-year, 19-fight run with UFC that saw him earn wins over Mirko Cro Cop, Antonio Rodrigo Nogueira, “Bigfoot” Silva and Cheick Kongo. With 19 of his 22 career wins coming by way of knockout or submission, “Big Country” is ready to make his return to Spike, where he memorably defeated the late Kimbo Slice and later went on to win season 10 of The Ultimate Fighter. Ayala will enter the Bellator cage against Nelson looking for another shocking upset following his last outing against Sergei Kharitonov at Bellator 163, where Ayala stole the show against Kharitonov by stopping the Russian heavyweight with a powerful punch a mere 16-seconds into the first round. Now, given the opportunity to formally welcome Nelson to the Bellator fray, “Eye Candy” is looking to stun the crowd once again and firmly establish himself as a threat to the entire heavyweight division. With all five of Ayala’s wins in Bellator coming by way of stoppage, the matchup with Nelson is sure to produce fireworks.